ThunderFAP.com is now FreeSamples.org, a website where you can not only get free samples but also tons of different coupons that you can use when doing your shopping. 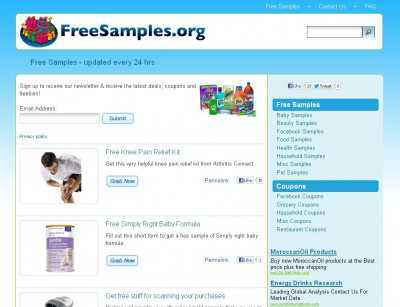 The contents of this site are clearly categorized, and on the homepage you can access any of two sections: “Free Samples” and “Coupons”. 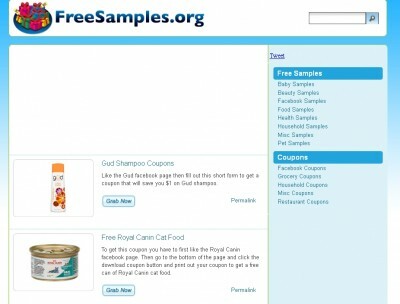 The “Free Samples” category includes all of the following: “Baby Samples”, “Beauty Samples”, “Facebook Samples”, “Food Samples”, “Health Samples”, “Household Samples”, “Misc Samples” and “Pet Samples”. For its part, on the “Coupons” category you’re going to find “Facebook Coupons”, “Grocery Coupons”, “Household Coupons”, “Misc Coupons” and “Restaurant Coupons”. Of course, coupons can also be shared with your friends via e-mail, and (just in case you need them) permalinks are provided.